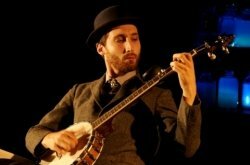 David is a diversely creative guitarist and banjo player who composes for theatre and original projects. in NZ, Singapore, Australia, India, Germany and the U.S.A. He is perhaps best known as Composer, Musical Director and character from all of INDIAN INK THEATRE COMPANY'S productions of the last 11 years: KRISHNAN'S DAIRY, THE CANDLESTICKMAKER, KISS THE FISH, GURU OF CHAI, THE ELEPHANT THIEF and THE DENTIST'S CHAIR. For his work with this company he has twice won the CHAPMAN TRIPP THEATRE A (2010 and 2014) for ​ "Most Outstanding Composer." Old-Time, Folk and Blues projects such as WHEEL OF EXPERIENCE and SHINDIG, as well as numerous roles performing as collaborator and sideman with many of New Zealand's most talented artists. He was a member of the popular Country/Rock N' Roll group THE BROADSIDES and other country artists such as TAMI NEILSON, winner of multiple NZ Music As. For the past 15 years he has taught Guitar, Banjo and Music Theory. 2006- 2008 : Guitar Tutor at Chilton St James Private Girls School. One on one and small group itinerant guitar tuition. 2002- Present: Private Guitar Tutor. Set up private studio for weekly guitar and banjo tuition, teaching wide range of ages, abilities and styles. 2001-2002: Technics Music Academy Music tutor. One on one weekly guitar lessons as well as group musical activities for school holiday programme. "I have experience teaching people of all ages, levels of accomplishment, and musical styles. I get great satisfaction helping students reach their unique individual musical goals. Any questions welcome!" David teaches Clawhammer, Oldtime Fingerpicking, Bluegrass and Contemporary banjo styles. With a music degree in Jazz Performance, and an eclectic career putting theory into creative and professional practice, lessons with David will help you to demystify : Technique, Scales, Modes, Harmony, Improvisation and "How it all fits together". Unlock that fretboard!